Elisha Barber, the first book in my Dark Apostle series, features a barber-surgeon protagonist. During the Late Middle Ages (about 1300 to 1450, depending on whom you ask) the barber occupied one of the lowest steps in the hierarchy of medical practitioners. A Physician examines a patient while a barber prepares for blood-letting. Even below him, though often lumped together with him when disparaging remarks are made by their so-called betters, is the village wise-woman, who served a local, rural population as pharmacist, midwife and general practitioner. Her knowledge of herbs and traditional techniques, as well as her reliance on superstitious methods of healing, later made her a target of witchcraft accusations–but that’s another blog for another time. Mid-wives continue as a separate category of specialist even in cities throughout the period. Working primarily in larger towns and urban areas, the barber not only cut hair and shaved beards, but also, by virtue of his ready razor, performed bloodletting at the order of a physician, or as a routine practice for clients who understood their humors to be out of balance. He served as a first aid technician, patching up wounds and extracting bad teeth, as well as performing common minor surgeries like lancing of boils and removing gall or kidney stones. Barbers learned their trade through apprenticeship and practice, and were expected to join the guild that regulated their role. 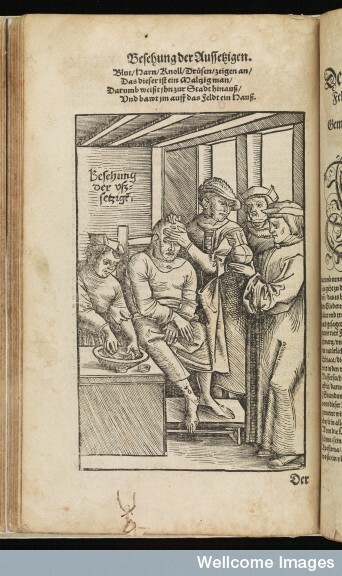 A barber’s guild in London existed prior to 1308 at least. Above the barbers, one finds the surgeons. Nowadays, if you ask a hospital nurse, you’ll likely find that specialist surgeons have an unparallelled reputation for arrogance. During the Middle Ages, however, surgeons were considered to be craftsmen, skilled with tools and capable of carrying out a wide variety of tasks. Most surgeons at the start of this period also trained by apprenticeship, but some of the universities had introduced surgery as a discipline, much to the annoyance of the Physicians, who sat at the top. Surgeons like Guy De Chauliac (surgeon to Pope Clement VI) and the later Ambroise Pare compiled texts to educate others and clearly had the respect of their contemporaries, as their high-status patrons can attest. The surgeons of London did not have their own organization until 1368, and in 1540, the Barbers and Surgeons merged into a single guild. Perhaps this dichotomy–the high position of many surgeons versus their theoretically low status–can be explained by the increasingly divergent course of learned medicine represented by the Physicians. Physicians attended prestigious universities like Paris, Bologna, and later Oxford, where they studied the classic texts of medical knowledge handed down by the Greeks. They genuflected at the altar of Galen, who lived in the first century AD and acquired much of his anatomical knowledge from the dissection of animals rather than humans. They ascribed to the theory of humors: the four substances in the body (blood, yellow bile, black bile, and phlegm) that supposedly caused illness in both mind and body. Their prescriptions might take into account not only the comparison of urine samples to charts, but also the season of the year and the patient’s astrological sign which were considered to affect the balance of humors. This entry was posted in Elisha Barber, historical medicine, history, medieval, The Dark Apostle and tagged barber-surgeon, bloodletting, historical medicine, history, humoral theory of medicine, late middle ages, medieval, medieval medicine. Bookmark the permalink. Instructive and fascinating, as always! I didn’t realize that the medieval medical scene was so multilayered. Termite Queen has a new review on Amazon, if you’re interested.